Jovees Herbal Anti Hair Loss Shampoo developed scientifically, helps to preserve the integrity of the herbs thus giving optimum results. A herbal preparation containing Henna, Ginseng & Capsicum ext, along with other natural botanical extracts has therapeutic properties that aid in controlling hair loss, provide nutrition and strengthen the hair shafts. It will also help to improve texture and give volume to the hair. 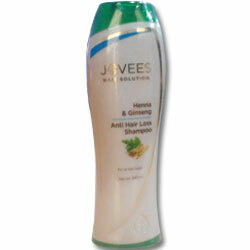 In case of acute hair fall preferably use Jovees Amla & Bael Hair Tonic every night before going to sleep. Wet hair. Lather and rinse thoroughly. Henna ext, Ginseng ext, Capsicum ext.